Ticket to Ride is a government designated small business. Despite its small size, the annual sales approach ten million dollars. 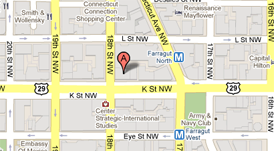 Ticket to Ride is a full service travel agency located a few blocks from the White House in downtown Washington DC. The agency was founded in 1992 by the current ownership and management. The agency handles primarily business travel, most of which is outside the United States. We offer assistance with airline ticketing, hotels, car rentals, and train tickets. We have a very experienced staff at a very competitive service fees. We are members of the Better Business Bureau of Washington DC and have received high ratings from the Washington Consumer Checkbook. Copyright © TICKET to RIDE Inc.